At SMF, we believe the treasure of God's Word hidden in your heart is the best reward for memorizing it. But sometimes tangible rewards are a helpful way of staying motivated. When you purchase any SMF memory book or journal, you're automatically enrolled in our free reward program. No forms, fees, or hassle! Just pay a small shipping charge each time you claim a reward. Sound to good to be true? You can thank our donors for that! Because of their generosity, we're able to reward Scripture memorization with no strings attached! 1. Pick out your memory book or journal. 3. 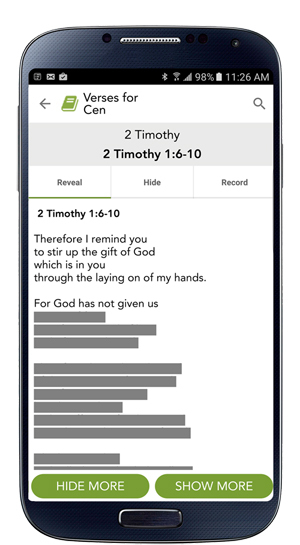 Claim your prizes at scripturememory.com/claimrewards. When am I eligible for rewards? With memory books, you get a reward for every 1/3 of the book you complete. So if the book has 15 lessons, you can claim a reward at lessons 5, 10, and 15. With passage-based memory journals, you can claim a reward for each full chapter you complete. How long do I have to earn rewards? Six months from the date your memory book/journal is purchased. What is the cost of rewards? Rewards themselves are free; you just pay shipping (usually just a few dollars). Is there a limit on the number of rewards I can earn? Rewards are limited to 4 per memorizer per 6 months.